Swanton quarterback Dylan Gilsdorf hands off to Tyler Gowing during the game against Start. 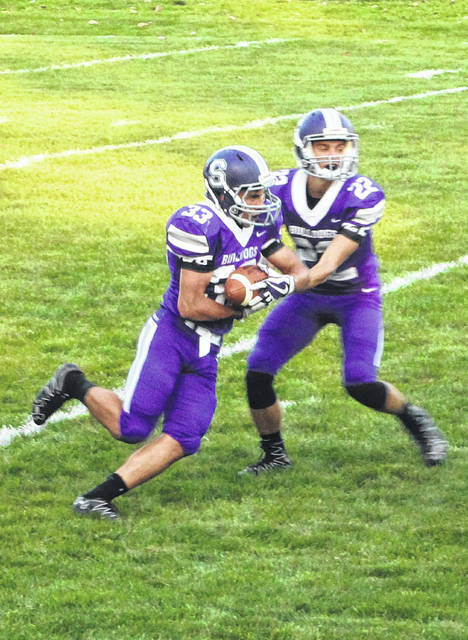 It was a good news, bad news situation for the Swanton football team on Friday. The good news was they came from behind to beat Rogers 25-24 and move to 2-1 on the season. But, for the third straight game, the Bulldogs lost a key player to injury. Senior running back and defending Northwest Ohio Athletic League scoring champion Michael Lawniczak left the game against the Rams with a knee injury. He joins Xavier Willams and Hunter Mix on the injury list. A pair of first half touchdown from Lawniczak gave Swanton a 14-12 lead over the Rams. Riley Hensley added a field goal in the third for a 17-12 cushion. But Rogers answered with a pair of scores. First Christian Warren found Daevion Arnold for a 20-yard touchdown pass. Then Warren ran it in from 11 yards out. The Bulldogs stopped both two-point conversion tries and trailed 24-17 in the fourth quarter. Despite the injuries, the Bulldogs responded. Dylan Gilsdorf punched it into the end zone from a yard away to get Swanton within 1 point with under two minutes to play. Kerns made the call to go for two. Devin Crouse found the end zone, giving the Bulldogs the one point victory. “I’m so proud of our kids for coming through Friday. The heart and resilience we are showing right now makes me so proud of our kids,” said Kerns. “Once they saw Michael go down, we could have quit and packed it in. You could see the emotion on the faces of a number of our kids when another leader went down. Swanton outgained Rogers 326-271 on the night, with 277 yards on the ground. The Bulldogs had 21 first downs to 12 from Rogers. Tyler Gowing led Swanton with 102 yards rushing on 24 carries. Lawniczak had 70 yards and two scores on 14 carries before the injury. Warren was 10 of 14 through the air for 193 yards with three touchdowns and two interceptions. Swanton will open league play Friday against a 2-1 Bryan team that just knocked off Fairview.